Called the "Museo del Medioevo e del Rinascimento" - the Middle Ages and Renaissance Museum, it is home to some very rare treasures and a room that I can only surmise holds the mystery of the true character of one of the most violent and potent of Maremma's medieval rulers: Count Niccolo IV Orsini. 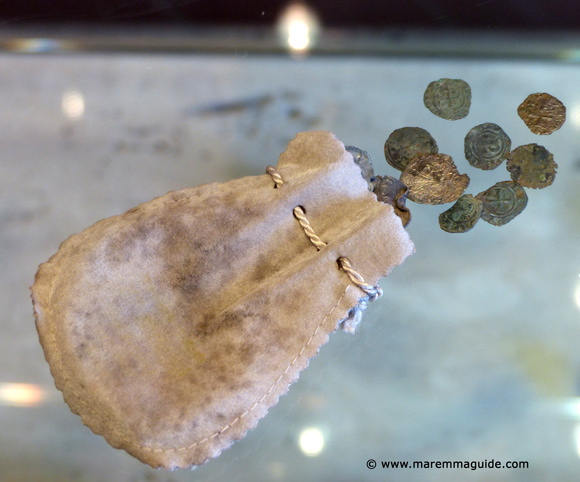 The finds of archaeologists during the restoration of the fort and from rubbish jettisoned into two water wells in the historic centre of Sorano are here. 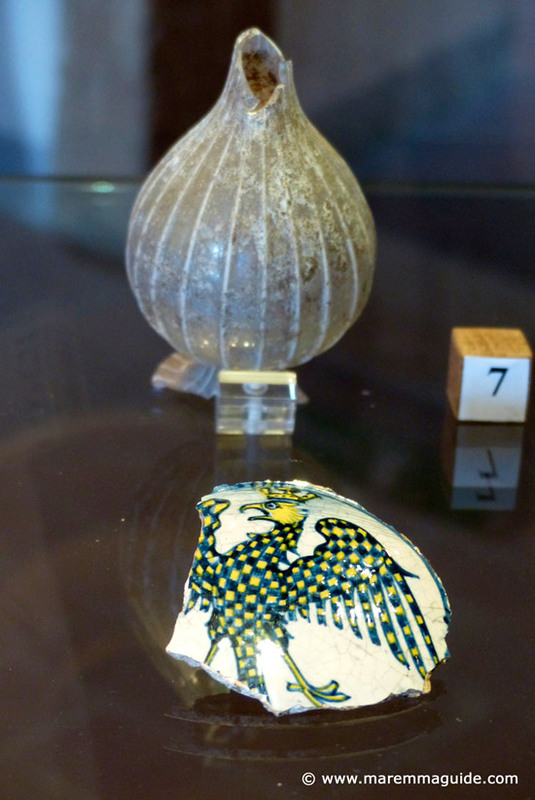 From perfume bottles, to ceramics and coins, the mosaic of the many pieces have revealed the daily lives of those living in Sorano during the middle ages and Renaissance years. 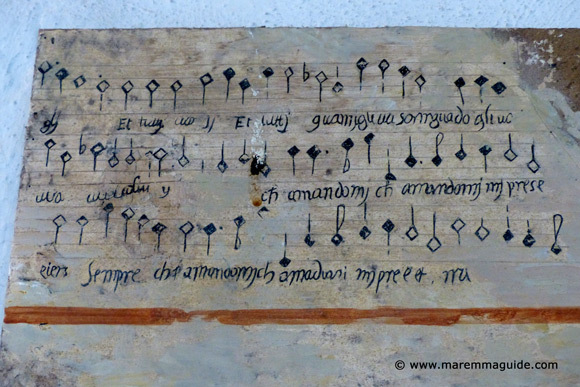 There is even a part of a plate commissioned by the family of Elena di Giovanni Conti of Montelanico - the daughter of the Counts of Montelanico - upon her engagement to Niccolo III Orsini, whom she married in 1467. It is decorated with a crowned eagle, with checkered blue and yellow wings and a lowered tail. She would have taken the dinner service with her to Fortezza Orsini while she lived there awaiting the restoration of her next home, the Orsini Palace at Pitigliano. 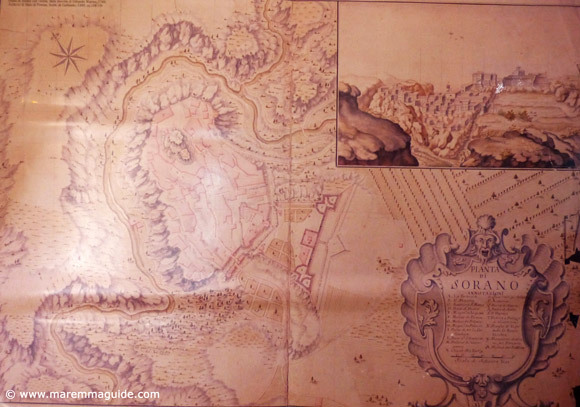 It is home to reproductions of the castle and fort plans, paintings of the Orsini family, and ancient land maps. 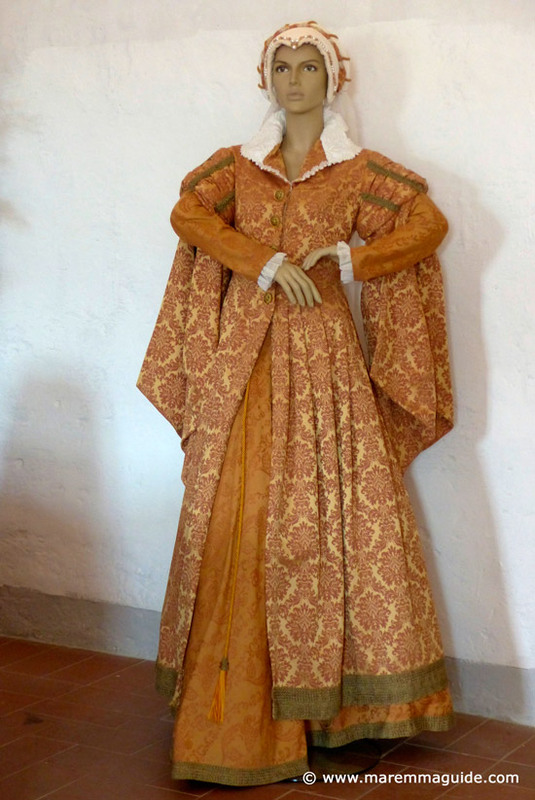 And the wedding dresses of Margherita Aldobrandeschi. But the frescoes in the octagonal tower room are original. And it is those that are the unusual treasure I mentioned above and which hold secret a mystery: the truth about the real character of an Orsini Count. 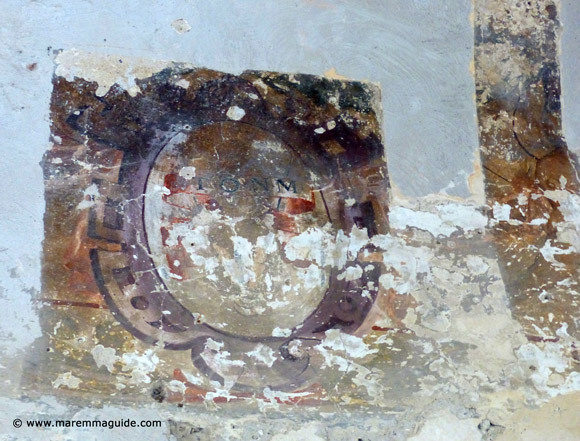 Although the frescoes are not directly on the walls of the castle tower, they are the originals and in their original positions. 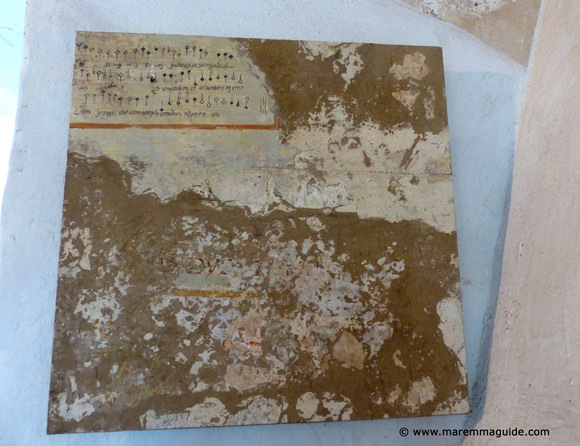 They were removed in order to preserve and protect them, sealed on plasterboard and then re-hung. And it is this room that is the most interesting. Not just because it is said to have the finest view of Sorano from one of its windows - and oh, boy, it it is a spectacular view - but because it was here that history has it the violent Niccolo IV Orsini held-up in the castle and had women that he took a fancy to brought to him. 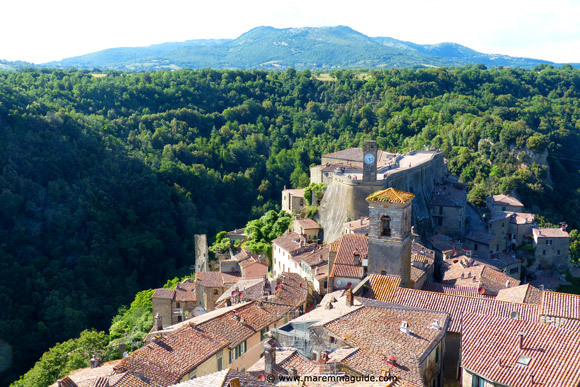 The spectacular view of Sorano Italy from Niccolo IV Orsini's palace tower room. It is a small room and would have been a warm one in winter with the heat from its own large open fireplace. 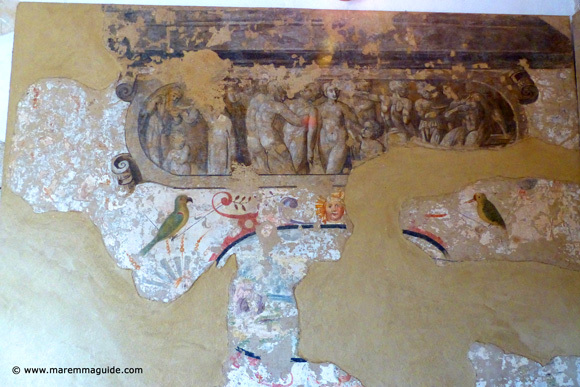 The museum literature tells that Niccolo IV Orsini had artists decorate the palace rooms with frescoes of grotesque scenes, but saw none in the tower room. Instead a hummingbird and a parrot - it was the time of Colombo's discovery of the Americas - and two mythological scenes. The first, the suicide of Dido the first Queen of Carthage, and the second, the wedding of Aeneas, the son of the goddess Aphrodite, with whom she had fallen in love whilst he had beguiled her with his Trojan hero tales. 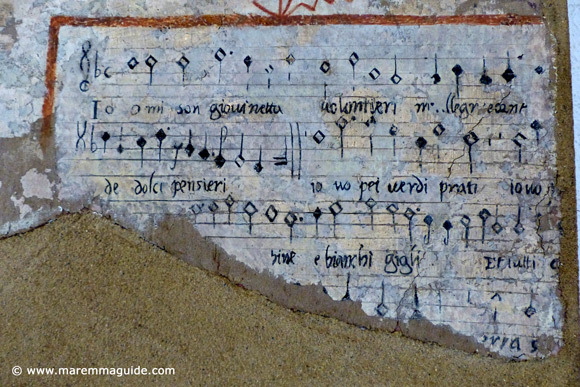 And a very very rare - it is the only one in the world - painting of a 16th century musical score: a madrigal for four voices. Music by the Renaissance singer and composer Domenico Maria Ferrabosco, most famous for his madrigal the, "Io mi son giovinetta", a ballata from Boccaccio's Decameron. The two pieces that remain clearly visible today. So if the palace rooms were a continued expression of the outward character of Niccolo IV Orsini, was this room in fact his internal self when no one else was around? Why would an evil man care to have his bolt-hole decorated in such a light and contemporary way, with Renaissance art, music and poetry, only to continue his aggressive behaviour within its walls. Or were his sexual liaisons of a more gentle kind? Local legends only serve to continue the mystery. One of a secret staircase the steps of which a local Jewish woman, Bettina, would climb from the ghetto in the town to this room. Now, having visited, I can well believe that there are secret staircases in this fort. And of another, Antea, whom Niccolo pursued when she managed to escape and following her flight, fell from the ramparts. 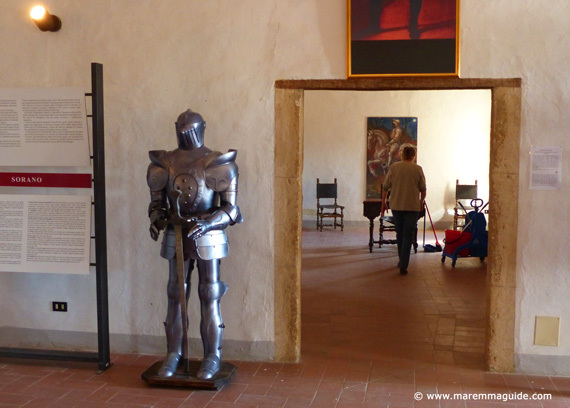 Access to the museum is included within the ticket price and tour of the Fortezza Orsini: it marks the last part of the fortress tour after which you are free to stay and wonder around its exhibits. 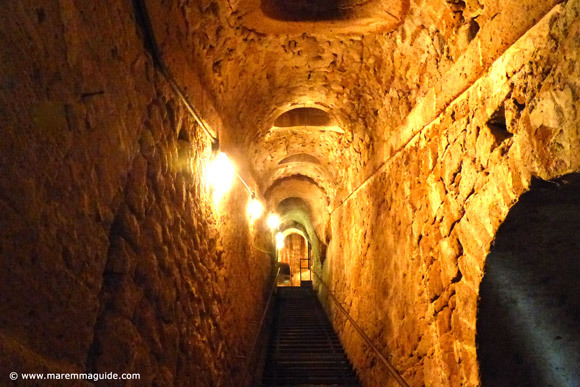 Take a tour of the Orsini fortress and find out about who roams its underground corridors at night... the Fortezza Orsini di Sorano.